YouTuber Shane Dawson is always in the news lately, but not for the reasons he wants to be. You’ve probably heard the name in some capacity, but for those who aren’t super familiar, Shane Dawson is a famous YouTuber best known for the revolutionary, multi-part series he posts on his channel. Other YouTubers like Jeffree Star, Jake Paul, and Tana Mongeau have all been the subject of these documentary-like series, while other series focus on more conspiracy theory-related topics. Most recently, Shane was responsible for shedding light on the wild conspiracy theory that Chuck E Cheese’s might be recycling uneaten pieces of pizzas and giving them to other customers for consumption. Strap in, kids, because it’s time for the second installment of Extreme Pinterest Writing Prompts, what has now become a series here on the Atlas Blog. Previously on EPWP, I wrote 100-word creative writing blurbs based on a Pinterest writing prompt I dug up from my archives. This time around, however, we’re raising the stakes. I’m still keeping myself self to the 100 words or less mark. This time, however, instead of me choosing my own prompts, I’ve given my friends and family the authority to choose the prompts for me. I won’t get to see what they’ve chosen for me until it comes time to write. Every weekend as a teenager, I would stay at home and watch YouTube videos hours at an end. I was never bored and there would be times that I would act if I was on camera saying, “I hope you guys liked my video so make sure you like, comment, and subscribe!” I always imagined how life would be like having a YouTube channel, going to VidCon which I still haven’t achieved yet, and doing meet and greets. I wanted my own channel so bad! Ever since I was 14 years old, I wanted to create a YouTube channel because at the time that was one of my passions and dreams that I had at the top of my list and with a hard “No” rejection from my mom, I turned around and thought that “Well, I guess that’s it for me.” For some reason, as I went onto high school and entered college, I’ve always kept in the back on my mind that I will create my channel one day and live up my YouTube dreams. Lights, camera, action! That’s what it felt like when I had to strut through the stage this past Friday. 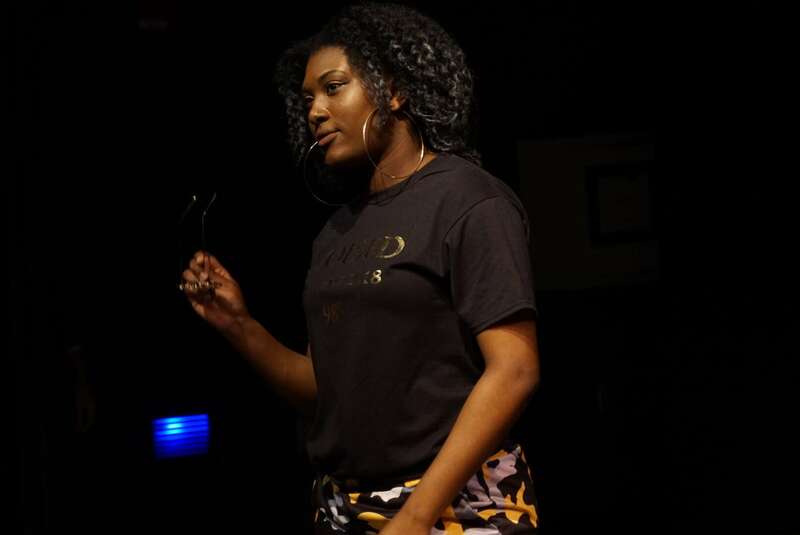 E.B.O.N.I., Emerson College’s Black Organization with Natural Interest had its 2nd annual fashion show at the Greene Theater. Wait, let me backtrack for one minute because I didn’t just get on a stage and start walking. It was just something I did out on a whim, not knowing what I was getting myself into. This was a whole new experience for me. One of the most vivid memories I have from my adventures in preschool is how I found out I was allergic to all kinds of animals. I had one goal in preschool and that was becoming the Bunny Keeper. Every single time my class would go to the library, that is where Lucy’s cage is held, I would never get a turn to pet her. I thought to myself if I become the Bunny Keeper I would finally be able to stick my hands into her silky grey fur. So when Mrs. Harkey called my name I felt like I just won a game show. I walked with cockness for the rest of the day. My little four year old body was filled with excitement so I skipped lunch and went straight to the library. I looked over at Mrs. Harkey’s desk, she wasn’t there. I continued with my duty. I grabbed the jar of small brown cylinders to feed Lucy and a bottle of water. My paint stained fingers fumble with the lock of the black cage. The excitement that is growing uncontrollable inside of me can’t be contained anymore and I stuck my tiny hands into that cubby bunny’s fur. It felt so silky soft. I wanted more so then I grab her and lift her up to my face, I rubbed that bunny all over my face. Oooh god I thought I was going to die of happiness. I woke up in the nurse’s office with the paramedics at my side. Apparently I went into anaphylaxis shock. I was very confused and anxiety started to spread through my body. I wanted my mommy. It felt like months went by until I heard that familiar voice. It was my mommy and herer face immediately told me that something bad happened to me. Then next day I was taken to the my pediatrician and she explained that I couldn’t touch certain animals with certain kinds of fur. Here is the list that she gave my mommy: rabbits, bunnies, rats, mice, hamsters, guinea pigs, wessels, chinchillas, pretty much any kind of rodent, cats, or any kind of Felidae. I’m also allergic to marsupials. I also can’t go to petting zoos because I am allergic to most of those animals too. Summers were rough for me because my grandmother had this cat and the cat loved rubbing against my legs. My legs instantly would get a rash and swollen. I hated visiting my grandmother because of that cat. He would also get in my bed when I was sleep and I would wake up with swollen eyes and not able to breath. Vacationing at grandmama’s was hell. My grandmother use to live with my aunt down in Mamai, Florida before she passed away. First of all I hate Florida. I hate the whole entire state. I don’t know if it’s because I was forced to go there every single summer of my life. The cat didn’t make things easier for me either. For some reason it choose me instead of my sister who can actually pet him. The cat name is felix. This cat is still alive today and it still ruins my summer. Felix loves me I don’t know why because I don’t give up a cat person vibes. Yes I think cats are adorable and I would definitely love to cuddle one but I just physically can’t. Felix is like a frat boy after one to many beers he doesn’t take no for an answer. My sister loved Felix but felix didn’t love my sister. He would claw at her and stretch her legs up. My sister would chase the cat around the house but he would just come towards me. This made my sister really mad. Felix just loved what he can’t have. It’s sad to think I will die without knowing how it feels to cuddle with any of those animal that are on my NO list. But I will always have those brief seconds with Lucy and her fat chubby bunny body before I passed out. She was my first and last forbidden animal that I touched. But even if I can’t cuddle with all of these adorable creatures I fill in the avoid with dogs. I just surround myself with the four legged animals and all of my sadness of not being able to love small fuzzy creature goes away. I love my two dogs and they might not be small or furry but I wouldn’t change them for any other pet. Well…maybe for Lucy. I am an unapologetic consumer of celebrity gossip. There is nothing that delights me more than the tangled webs our stars weave before our very eyes. The joy I get from a new installment in The Cut’s gossip column, or from an Instagram stalk that makes me aware that the creative directors of Bumble are sisters, and also the daughters of musician David Foster, who is currently dating the actress/singer Katharine McPhee, who is younger than said creative directors, and that 69-year-old Foster is newly divorced from Yolanda Hadid, of Housewives/being Bella and Gigi’s mom fame. Tangled webs, I tell you.